Most kids will sleep with a cuddly toy of sorts. 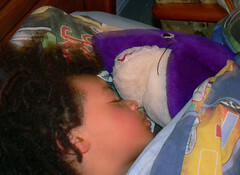 JJ has taken to sleeping with sharky. Not the most attractive thing to wake up next to I would have thought but it’s something to comfort him at night I guess. Before I took this photo he had his arm around the shark. Very cute. He is such a deep sleeper that the flash going off does not stir him one little bit.